The euro has shown a sharp weakening on the trades against the dollar. The Eurozone manufacturing and service sectors activity reports were disappointing. The service sector index fell to 51.3 from 52.3 while the manufacturing sector index fell from 50.6 to 50.4. We should pay attention to the M. Draghi’s speech at the European Banking Congress in Frankfurt. The euro/dollar cannot test and overcome the resistance level of 1.2580-1.2600 and fell below the level of 1.2405-1.2425. 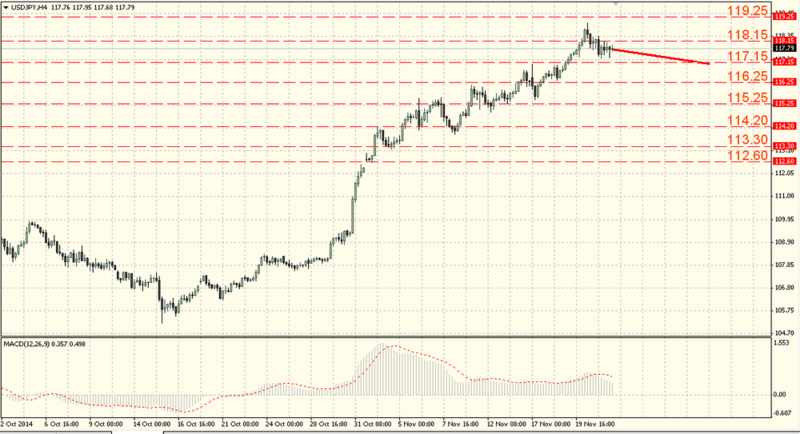 The support levels are 1.2330-1.2350, and the resistance levels are 1.2425-1.2445. The EUR/USD consolidation phase was followed by the support of 1.2405-1.2425 breakthrough that can lead to a fall towards 1.2330-1.2350. In its turn, the pair growth and ability to consolidate above 1.2580-1.2600 will signal about the upward zigzag base formation. The British pound was in the leadership positions against the US dollar, but by the end of trades had returned to their original positions and closed the session at the opening prices. The British news set to disclose the information about the public finance situation. We assume that the public sector net borrowings rose (PSNB) in October, but not so much as it was earlier to 7.8 billion vs. +11.8 billion pounds in September. The pair managed to test 1.5730-1.5750, but failed to break through above this level and it fell to the local support level of 1.5630-1.5650. The pressure on the pound is preserved and with it the support mark of 1.5630-1.5650 testing and breakthrough risk, resulting in the fall at least to 56th figure. Obviously, the pound has to rise up and consolidate above 1.5730-1.5750 for the upward correction development. The pair dollar/yen stopped its growth. Then the interest for the dollar began to decline and the pair returned to the opening prices and formed a consolidation. The sentiment amid the US and Japan monetary policy polarity and the Prime Minister Abe decisions regarding the sales tax introduction supported the dollar. The technical factors and the uncertainty in the stock markets as well as the “Treasuries” profitability slight decrease put some pressure on the pair. 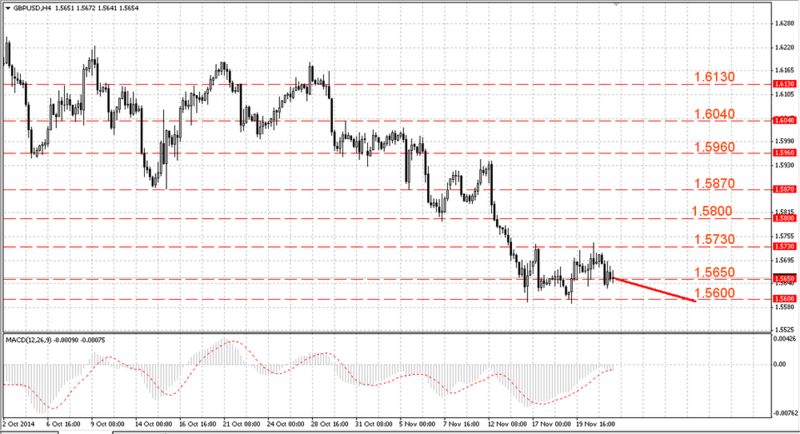 The price has risen above the level of 118.15-118.35, fixing the next target and even briefly traded above these levels. However, the pair failed to consolidate above these levels and returned below this level where it is now. It is recommended to buy with the first target of 118.15-118.35. 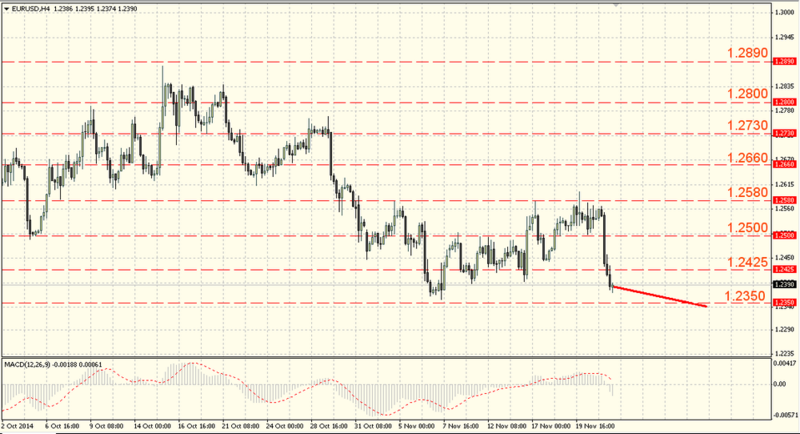 If the first target is overcome, then the new target for longs will be the level of 119.25-119.45. The stop loss orders are below the level of 116.95-117.15.